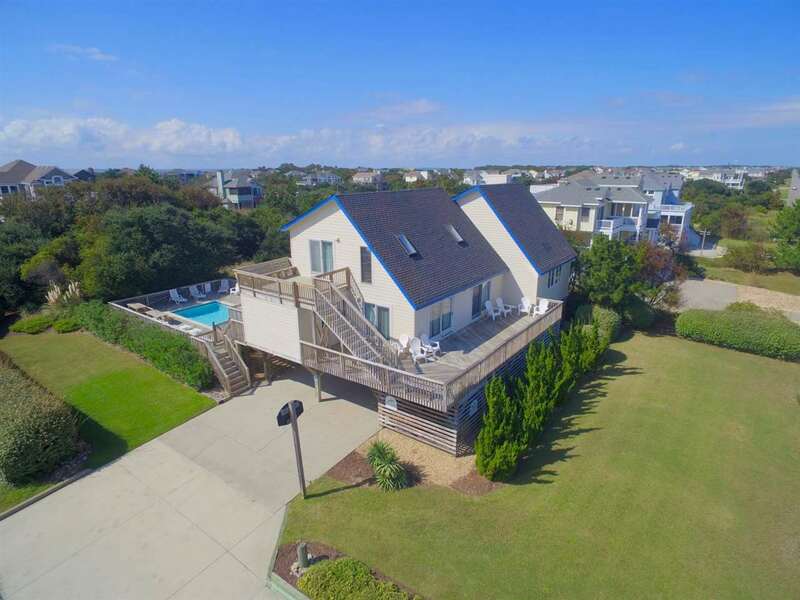 900 Whalehead Drive, Corolla, NC.| MLS# 102274 | Outer Banks Homes For Sale, North Carolina Home Search Including Nags Head, Pirates Cove, Manteo, Kill Devil Hills Kitty Hawk, Southern Shores, Duck, and Corolla North Carolina, Oceanfront and Soundfront properties for sale and long term rentals. Located on a private corner lot, with no through traffic and direct beach access. This 5 bedroom 3.5 bath home has a traditional floor plan and exudes character. Buyers will love it because it's not your typical rental machine. Plenty of room for the entire family to spread out with over 2600 sq. ft. including; loft in master suite with gas fireplace, loft on 2nd level, great room, game room and multiple decks (covered and sun). The 22,000 square foot lot is low maintenance and has been professionally landscaped. Home included private pool and hot tub, and has great ocean views from decks. Level 1: carport; entry, recreation room, bedroom with 2 bunk sets, half bath, laundry. Level 2: great room with ocean views, dining, kitchen, queen bedroom, bath with shower, 2 story romatntic king master bedroom suite with gas fireplace, whirlpool and shower, cozy private den with queen sleep sofa and deck overlooking the private pool. Level 3: loft/kid's area with skylights, King bedroom that shares a bath with another bedroom. New stainless Steel appliances (2018), and seller is installing carpet to replace light blue carpet in the next month. Sellers don't maximize rental calendar, Seaside Property Management says could generate over 52k if you allowed entire calendar to be open. See projection in associated docs!